WASHINGTON, DC – October 18, 2013 – On Wednesday, October 16, advocacy group Bahrain Watch leaked a document revealing the details of a purchase request made by the Bahrain Ministry of Interior for massive quantities of tear gas. 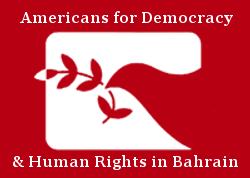 Given the Government of Bahrain’s history of abuse of these ‘non-lethal weapons,’ often resulting in the serious injury and death of peaceful protesters, Americans for Democracy and Human Rights in Bahrain (ADHRB) is deeply troubled by this development and calls for the immediate halt of all shipments of tear gas to the country. Evidence of the Government of Bahrain’s misuse of tear gas, including as a form of collective punishment, has been well documented by the UN High Commissioner for Human Rights, Physicians for Human Rights, and the Bahrain Independent Commission of Inquiry (BICI) Report. While the Bahrain government claims it uses tear gas merely as a tool for crowd dispersal, its misuse has led to health complications, serious injury, and even death. To date, the security forces in Bahrain have misused tear gas by firing it directly into private residences & religious places, most notably during after-dark reprisal raids on villages suspected of housing demonstrators. Additionally, Bahraini security forces have been known to shoot tear gas canisters directly at protestors during demonstrations, often at head level and at short range. The magnitude of tear gas requested through the Ministry of Interior’s purchasing order suggests the Bahrain government’s commitment to systematic misuse of the weapon goes far beyond the scope of calming public demonstrations. Due to Bahrain’s abuse of tear gas, the United States banned the export of the weapon to the country in 2012, noting concern for “excessive use of force and tear gas by police.” The leaked document shows a request for over 1.5 million canisters of tear gas for the roughly 1.2 million people living in Bahrain. Please click here for a PDF of this statement.